"This pass is called Echo Cannon & this Evil little stream whose crooked windings cursed us to bad roads is Echo Creek. . . . the scenery through this Cannon is magnificent Sometimes the mountain seems to hang over our heads as the road passes close under it. On the left is smooth high mountains covered with green grass, and in the ravies fir & cedar but upon the right these mountains rise almost perpendicular 1000 feet They are of gravel & stone cemented together by some earthy substance tops covered with cedar & scrubby oak sides perforated with many holes in which birds have built their nests & whose chirping we could distinctly hear & there is a substance oozing from the crevices which when burning emits a naceous effhusin resembling assofirdita Masses of rock had fallen in many places by the road side & becoming subjected to the influence of the weather, . . . 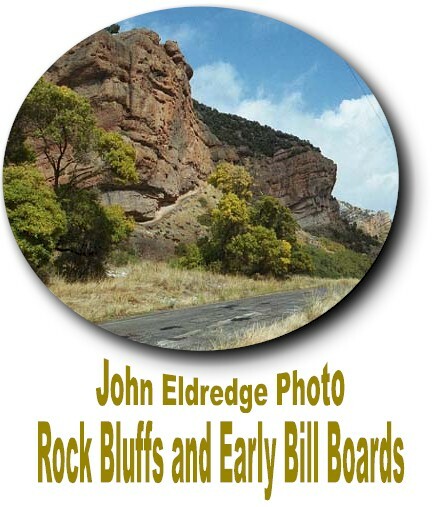 In some of the ravines between the Bluffs the rocks assume such fantastic shapes caused by the waters washing down each side & leaving this mass in the center near our camp was a fine speciman"
Painted on these bluffs are two early billboards.